Jordan Belfort was notorious for living in excess. Stock market fraud and swindling unsuspecting fathers and small-time businessmen were just another day at the office for the New York stockbroker in the 1990s. Belfort thumbed his nose at authority and convention to live the lavish life others could only dream of, if they weren’t in on the rouse themselves. However, it was also those actions that led him to spend time in federal prison for what was coined as a “pump and dump” scheme which ruined lives to the tune of $200 million. Belfort’s story was the inspiration for the 2000 independent film Boiler Room, starring Giovanni Ribisi, Ben Affleck and a young upstart in Vin Diesel, and now his memoirs have become the talk of Tinseltown, with Martin Scorsese’s The Wolf of Wall Street. The Wolf of Wall Street stars Leonardo DiCaprio as Belfort, in a role that surprises and impresses with the lengths he went to inhabit the lifestyle of a man who just cared about his inner circle and the next big payday. This marks the fifth film DiCaprio and Scorsese have made together, and this one just appeared to be a party of debauchery and over-the-top moviemaking, a departure of sorts from their earlier films together. It had the frenetic pace of Gangs of New York, and the intensity of The Aviator and The Departed, but on a level that seemed a little uncharted for director and star. The hijinks in this film only escalated from the very beginning, and things got crazier the deeper in we got. But in typical Scorsese fashion, it was a rollicking ride from start to finish. Imagine the penultimate chapter in Goodfellas, where Henry Hill, high on cocaine, insomnia and paranoia that the feds are watching his every move, races around town trying to get his drug deal done. The pacing of those scenes is pretty much what you experience the entire 179 minutes of Wolf. This leads us to our one and only gripe about this film: it is entirely too long for a black comedy, even for a Scorsese black comedy. As much as you want to revel in the decadence and wickedness of Belfort and his cronies, there were certain scenes that just ran way too long for its own good. We clocked at least 25 minutes of unnecessary plot development that would not have detracted from the overall quality of the film. It slowed the pace of the film to a screeching halt sometimes, where we found ourselves waiting for the next scene to appear so we can continue following the story. This point just may keep Scorsese from the podium as Best Director at this year’s Oscars—that, and the controversy surrounding the content of the film supposedly blindsiding moviegoers expecting something completely different. Despite the controversy, DiCaprio was masterful as Jordan Belfort. The things he did in this film were different from anything we’ve seen him do on-screen. There are such extensive uses of drugs and alcohol and wild sexual activity in Wolf, mostly by Belfort and his second-in-command Donnie Azoff, played wonderfully by Jonah Hill, that it’s surprising this film didn’t receive an NC-17 (“X”) rating. One particular overdose scene comes to mind here, but we won’t spill the beans. Hill is turned loose in this movie as a faithful follower of Belfort’s, mesmerized by the flash and excess of The Wolf’s lifestyle. Australian actress Margot Robbie plays Naomi, Belfort’s mistress turned wife, and holds her own quite nicely when pitted against the juggernaut DiCaprio. Friday Night Lights’ Kyle Chandler plays Belfort’s foe, FBI agent Patrick Denham, who is dedicated to bringing down the corrupt stockbroker. Other notable names in Wolf of Wall Street include Jon Bernthal, Rob Reiner, Jean Dujardin and a great cameo by Matthew McConaughey which helps to establish the kind of person Belfort will become. This film is nominated for five Academy Awards: Best Picture, Best Director, Best Lead and Supporting Actor for DiCaprio and Hill respectively, and Best Adapted Screenplay for Terence Winter (Boardwalk Empire). Wolf was also nominated for four BAFTA awards and two Golden Globes, where DiCaprio took home the statue for Best Actor—Motion Picture Musical or Comedy. Since the Oscars don’t separate acting categories between drama and musical/comedy like the Globes do, both DiCaprio and Hill have to compete with a tough lineup of actors. We think they are the underdogs to the favorites of the Dallas Buyers Club in McConaughey and Jared Leto, but you’ll see why we made our picks for all the major Oscar categories in our Predictions post right before the awards begin on March 2. 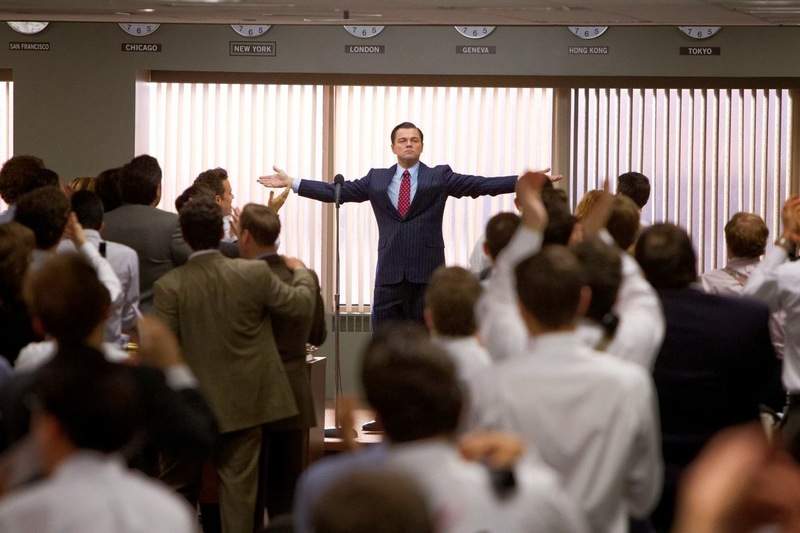 On March 25, The Wolf of Wall Street will be released on Blu-ray and DVD. A four-hour Director’s Cut of the film is rumored to be available soon thereafter.